Pull your right arm across your body as if to touch your opposite shoulder. This will drag the enemy forward; assisting him to fall after the Triple Strike technique just applied. Note that all three of the targets struck in this series were on the Centerline of the body. And, that the pattern conforms to the boxing principle of the "safety triple." Allowing that the first punch will probably be blocked, the second is intended to draw the opponent's guard away from its normal position, creating an opening for the third, which will likely succeed. Now it is time to bring the opponent to the mat for the finishing techniques. 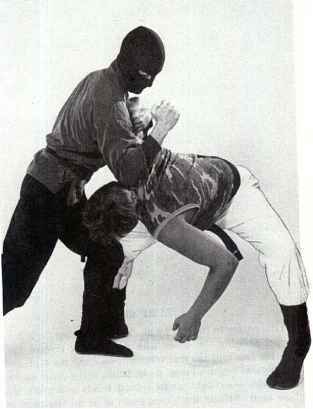 No other form contains so many techniques, which may be applied to a downed opponent. Some have a dramatic final stomp or punch to the ground simulating a coup d' grace, but only Kata Dan'te makes a point of teaching you to follow through and make sure the enemy isn't going to get back up again, ever. It should be noted, however, that all of these techniques are equally effective when used against a standing opponent, whether facing him or creeping up from behind. And, this same emphasis is seen in the Sentry Removal techniques of the Ninja. To execute the Vertical Elbow Drop, let the enemy fall forward as you continue to encircle his right arm. At this point his elbow is not locked, but his forearm is trapped and rests in the cradle formed by reaching across your body. As he passes waist level on his way to the mat, strike down forcefully with the point of the elbow to the back of his neck. This is a logical follow-up to the Horizontal Elbow Stroke, in which the arm-dock was used to pull the enemy into the strike. In this instance it is used to keep him from falling away from it. This attack crushes the back of the skull, impinging on the medulla oblongata; or, knocks the skull off the cervical vertebrae; or, separates the vertebrae by driving them apart; or, separates the seventh cervical vertebrae at the base of the neck from the spine. All of which sever the spinal cord and result in paralysis or death. And, as indicated, one need not be too accurate. The backs of the neck and skull are favorite targets for muggers and infiltrators. 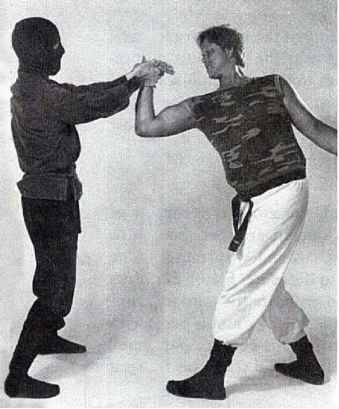 In some presentations of Kata Dan'te, an upward strike to the face with the right knee is applied simultaneously to crush the skull between them in a Hammer and Anvil Strike. 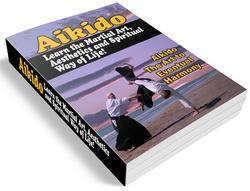 This also lifts the right leg preparatory for turning and slamming the enemy to the mat.